The autopsy report on the late Ruby-Ann Laufa, who died after she fell off her boyfriend’s moving vehicle, was made public today by city police. 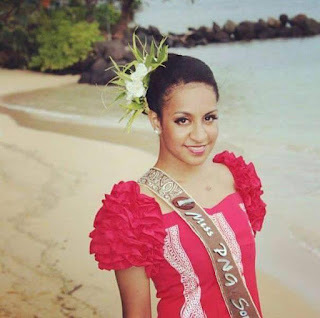 The report concludes that the Former Miss PNG Beauty Queen died after she sustained a basal skull fracture and blunt trauma to the head when she fell off the vehicle. Chief Sergeant Ulagias Mantu from the Homicide Unit said other injuries to her body were sustained when she fell on her back. The case will now be transferred to Traffic Police to decide whether to go ahead with investigations or request for a coronial inquest. “We will then be able to know if the suspect or the driver of the vehicle will be charged or not following investigations from Traffics, “said Mantu. Sergeant Mantu says there were only two people in the vehicle which was the driver and deceased when she met her fate and at this stage the police or the Homicide can only speak from autopsy report but eye witnesses must come forward if they’ve witnessed how this accident happened. Meanwhile the suspect was detained at the Boroko Police station for safety reasons and he left the station around lunch time today.